A few years back, when MuleSoft coined the phrase “application network,” it also launched an animation that depicted the spread of such a network as though it were a growing fabric of heterogeneous but connected nodes (you can see this animation in the sponsorship sting at the very beginning of this video). Today, much the same way science fiction movies have inspired modern inventions (think Star Trek communicators and cell phones), it appears as though that animation foreshadowed an actual feature in the Winter 2018 release of MuleSoft’s Anypoint platform; that of an interactive graphical application network visualizer. The idea, according to MuleSoft senior product marketing manager Ahyoung An, is to visually represent an interactive graph of a particular organization’s application network. Much the same way a social graph shows the interconnectedness between a person, their photos, their friends, their friends posts, and so on, Mulesoft’s application network visualizer presents a graphical view of the interconnectedness between the various assets that make up an organization’s application network. For example, APIs, SaaS applications, devices, service consumers, etc. (disclosure: MuleSoft, which is now a Salesforce company, is the parent company to ProgrammableWeb). The interactivity of the Anypoint Visualizer kicks in when the need to diagnose a problem arises. Typically, if a particular workflow isn’t performing well or breaks down altogether, the resulting detective work requires separate deep dives into the underlying services to figure out which one is problematic. The objective of Anypoint Visualizer is reduce that exercise from one that involves multiple panes of glass to one that involves just one. According to the company, a significant amount of the asset metadata that comprises the graph and the service details it reports on is drawn from Anypoint’s monitoring capability; something that until this point, offered typical drill-down reporting versus more of a bird’s eye view of the entire application network. But the drill down is still available by double clicking on any node, allowing application network administrators to get to the bottom of any issues pretty quickly. In addition to the introduction of the Anypoint Visualizer, the Winter Release also leverages the wisdom of the crowd when it comes to data mappings between dissimilar systems where Anypoint is the glue. Mapping dozens or hundreds of fields between complex systems and SaaS applications is a rather daunting task to start from scratch. 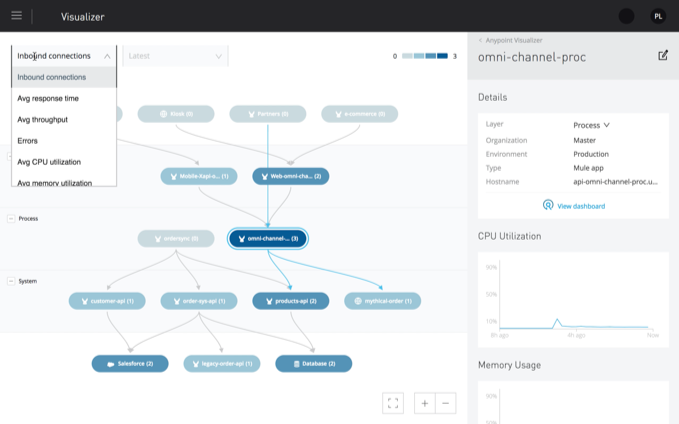 But now, with the application network graph in place, MuleSoft is able to apply machine learning to the data transformations happening across its customers in a way that the wisdom of all its customers surfaces in the form of recommended mappings. Also on tap in the Winter release are some beefed up security capabilities that can be dropped into Anypoint policies. These include an advanced form of rate limiting called “spike control,” more sophisticated message logging, the ability to add or remove headers from API requests and responses. Also, the new release includes response caching for frequently retrieved data (for performance). Later in 2018Q4, Anypoint will gain support for JSON Web Tokens (JWT). JWT is a standard that encapsulates API access tokens into a JSON object before transmitting them across a network. The object also includes the information for securing and signing them. Many existing API authentication workflows involve tokens that are passed as clear text without additional encryption or signing. Where such encryption and signing is implemented, it is often non-standard.